The Alameda Theatre Company’s De Colores Festival of New Works is Canada’s premiere festival for Latin-American playwrights and is the first playwrights unit in Canadian history to feature Latin-American/Canadian writers. This festival does not put on full-scale productions, rather, it consists of readings – the actors are not in costume, do not act out the scene, and read directly from the script. This is something you should be aware of going in. This serves to highlight the focus on the playwrights rather well. Each day an excerpt from a play is read, followed by a full read-through of another play. Thursday’s performances included an excerpt from Ayelen by Gilda Monreal and Staying Alive by stand- up comedian Martha Chaves. Ayelen is the story of a young warrior, Ayelen, the Eagle Spirit, who sets out to save her great love Pahana, the Condor Spirit, from the desolate wastelands of lost souls. It was read by the playwright and José Arias. It was a promising script, although we only got to hear a small piece and were told in advance that there would be a lot of movement planned that would not come through in the reading. I would be interested to see this as a full-scale production. Staying Alive is about the journey of an estranged daughter, Joanna, coming to terms with her mother’s cancer and her own sexuality, with the help of a chorus of drag queens. Some of you may be familiar with Martha Chaves’ work as a comedian, and as you would expect the script is very funny. It was performed by José Arias, Maria Del Mar, Ryan G. Hinds and Jonathan Morton-Schuster (who some may know from MTV Canada’s 1 girl 5 gays). It too would be a promising full-scale production. You can still catch the second half of the festival. Friday’s performance will include an excerpt from The Anti-Romantic by Aracely Reyes and La Danza Del Venado by Ari Belathar. The Anti-Romantic is a semi-autobiographical piece about a young artist disillusioned by love after a breakup. She vows to live her life completely devoid of love, only to find that it keeps entering her life through her art and the people around her. Aracely Reyes is a personal friend of mine and I am very excited to see what she’s come up with. La Danza del Venado tells the story of a group of migrants trying to cross the U.S. border into the Sonoran Desert of southern Arizona. 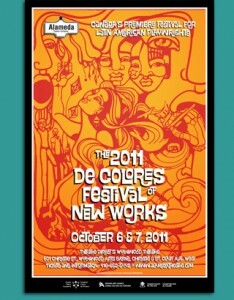 I hope to see some of you at Part 2 of the 2011 De Colores Festival of New Works this evening! – The 2011 De Colores Festival of New Works is playing at Artscape Wychwood Barns, 601 Christie St. (at St. Clair Ave. W.) on October 6th and 7th at 8pm. – General tickets $15, Students/Seniors $12, Festival Pass $28 (All tickets include HST). – For tickets and info call 416-652-5442 or www.alamedatheatre.com or they are available for purchase at the door.